Roundabouts, also known as traffic circles, can present significant challenges for people impacted by blindness. In many cases, they will learn an alternate travel route to avoid encountering a roundabout. 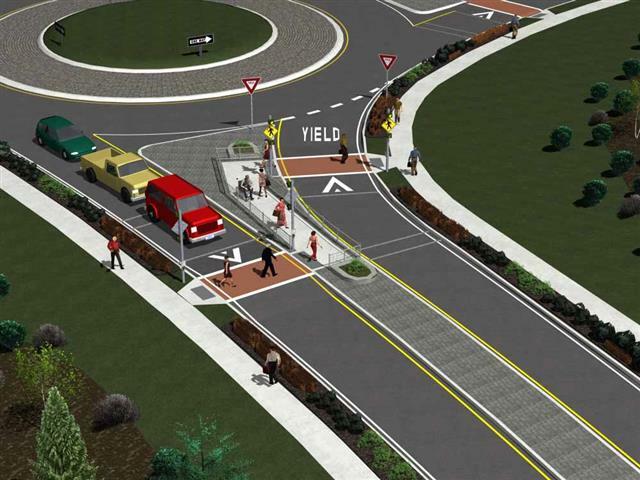 As cities choose to develop more roundabouts, they are creating barriers for people impacted by blindness to travel independently. Where roundabouts are planned, an extensive public education campaign, targeted at both pedestrians and drivers, should be an integral component of any new installation. A pedestrian crossing system at a roundabout featuring an offset island in the middle of the approach road. The pedestrian route consists of a raised crossing for traffic calming. Source: Institute for Transportation Research at North Carolina State University. Don’t place water fountains or other features that produce background noise close to the roundabout. These features can mask the ambient sound of vehicular traffic. Avoid using visual barriers higher than 300 mm in the roundabout’s centre island. These barriers make it harder for drivers and pedestrians to see each other. They also create an auditory barrier for pedestrians. Use clear and consistent wayfinding strategies to give pedestrians both visual and tactile cues on where to enter and safely cross the roundabout. A combination of textured ground surfaces and painted marking should be considered to enhance visibility and detectability of the crossing route. For roundabouts with approach roads consisting of one or two lanes approach and exit legs, install a marked crosswalk equipped with an APS on each approach road where pedestrians are able to cross. The standard red/yellow/green traffic signals should be used, continuously set to flashing-green for vehicular traffic. In response to a pedestrian activation signal, the traffic lights would cycle through amber to red and remain red during the time allocated for pedestrian crossing. Non-signalized pedestrian crossings at roundabouts should only be considered for roundabouts with approach roads consisting of single-lane only approach and exit legs. In such locations, a stop line for vehicles should be indicated on the road surface accompanied by a “Yield to Pedestrians” sign that complies with the Manual of Uniform Traffic Control. It’s always preferable to have signalized pedestrian crossings equipped with APSs. Provide pedestrian overpasses or underpasses at roundabouts with approach roads consisting of three or more lanes approach and exit legs. Streetscape elements that require servicing by vehicles (e.g., bus stops, mailboxes and garbage bins) should be located at least 50 m from a roundabout, as these service vehicles visually and audibly obscure the pedestrian crossing. Design pedestrian crossings at roundabouts as mid-block crossings. For more information, see the section on curb ramps at mid-block crossings. Sidewalks around roundabouts should incorporate concrete barriers, fencing or landscaping at the edge of the roadway to discourage pedestrians from crossing to the roundabout’s centre island. An alternate type of guidance TWSI is recommended on road surfaces to assist persons with blindness to navigate road crossings as roundabouts. Further information is provided in the Tactile walking surfaces indicator sub-section of the section Exteriors and Interiors – Common Design Elements. A detailed study on the barriers created by roundabouts and possible solutions can be found in a report published by the NATIONAL COOPERATIVE HIGHWAY RESEARCH PROGRAM (NCHRP) REPORT 674 Crossing Solutions at Roundabouts and Channelized Turn Lanes for Pedestrians with Vision Disabilities (PDF). Emerging technology using in-road sensors and/or video can detect approaching vehicles and determine whether they are yielding or if there is a safe gap in traffic to allow pedestrians to cross. Some systems incorporate both methods. These systems then trigger visual and audible pedestrian signals indicating that it’s safe to cross. The efficacy of these technologies is still under investigation.